Reimbursement is part of overall settlement of Smart Water Meter Project funding, however, case is still ongoing. The City of San Diego has agreed to return more than $3.7 million to the city’s sewer fund which it took to pay for a citywide conversion to wireless water meters. The refund was made in hopes of ending a lawsuit filed by a ratepayer who said the city was charging the 8,500 sewage customers who do not use city water in order to help pay for the $67 million conversion to Advanced Metering Infrastructure, or AMI. The new meters will allow ratepayers to monitor their current water usage as well as make it easier to check for leaks. At the same time, the city’s water department would benefit in reducing meter reading errors and cut down on employee hours. But the rollout has hit bumpy terrain. 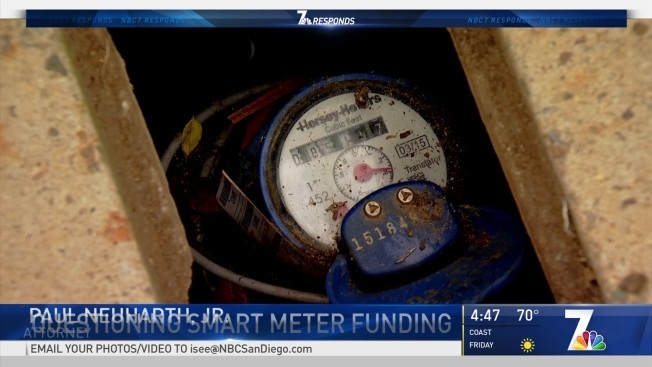 During a nearly two-year investigation NBC 7 Responds found that the city was made aware of a manufacturing glitch with one of the meter vendors but did not inform the public and does not know how many meters could potentially exhibit the so-called glitch. In addition, crews had been told to retrofit the old meters with the smart meter displays. Those retrofits resulted in some meter misreads, and astronomical bills for some ratepayers. Then, in March 2018, the funding for the AMI project came under scrutiny with the lawsuit from ratepayer Miller Marks. Attorney Paul Neuharth represents Marks. He says the city ignored recommendations from its oversight board to pay for the new wireless meters using 70 percent from water fund reserves and 30 percent from the sewer fund. Instead the city chose to divvy up the costs 50 percent by 50 percent. “The city chose to go forward at a 50-50 allotment without having any sort of background to justify that,” Neuharth told NBC 7 Responds. In March of last year Neuharth filed a lawsuit on behalf of San Diego ratepayer Miller Marks, alleging the city was dipping into the wrong bucket of money. In December 2018 the City Council changed the split to the 70 percent/30 percent ratio for the next five years, as well as sending $3.7 million back into the sewer reserves. But Neuharth and his client say five years is not enough. They are pulling the proposed settlement off the table. The City of San Diego, however, says Neuharth’s decision to pull the proposed settlement agreement is a ploy to get more in attorneys’ fees. The AMI project is currently on hold until an city investigation is concluded.